What is included in each session? Each session includes ALL procedures necessary to achieve the session goals ? How long is each session? 30-45 minutes ? Are you trained in Manual Therapy including Spinal Mobilizations? Yes ? How many Years of Experience? 12 years CCRP. 28 years PT. ? 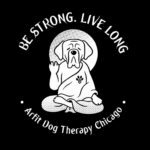 ARFit Dog Therapy provides comprehensive rehabilitation programs. We do not offer “à la carte therapy” such as laser only / massage only / dry needling only. Our programs are individually designed to decrease pain and improve the function of your pet. Our fees are as follows: Initial Evaluation: $105, Treatment Session: $145. Call us today at 312-620-4606 to schedule your appointment.